Mapp Digital is the new name created by the combination of BlueHornet Networks and the digital marketing-related applications business purchased from Teradata Corporation in July by Marlin Equity. If we look back a bit further, the previous acquisitions and brand names, like eCircle, ArgyleSocial and Ozone are part of the Mapp brand also. When BlueHornet and Teradata merged, Michael Biwer, CEO of BlueHornet, was appointed CEO of the newly formed company. At that time they also stated the launch under a new unified brand name. The announcement of the company’s new brand and market strategy was made at Dmexco 2016. 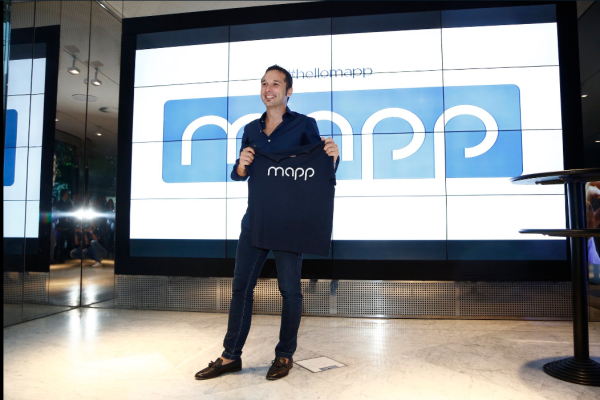 Earlier in the week Maurizio Alberti, the Italian Director of Mapp had shown off the new brand already (including t-shirts). Asking about the changes in technology, Mapp’s SVP of strategy Thomas Goldstein let us know that currently plans are being made to bring (parts of) the Teradata Marketing Application and BlueHornet platforms together and develop more functionalities. Mapp will provide a family of software and services including their data management platform (DMP); tools that optimize email, mobile, app, social and web marketing; and campaign management and strategy consulting. Earlier this year, Marlin Equity bought Revenew, Inc. and together with the marketing operations part of Teradata they relaunched the Aprimo brand in July. Although both Marlin equity companies, Aprimo and Mapp are completely separate entities.